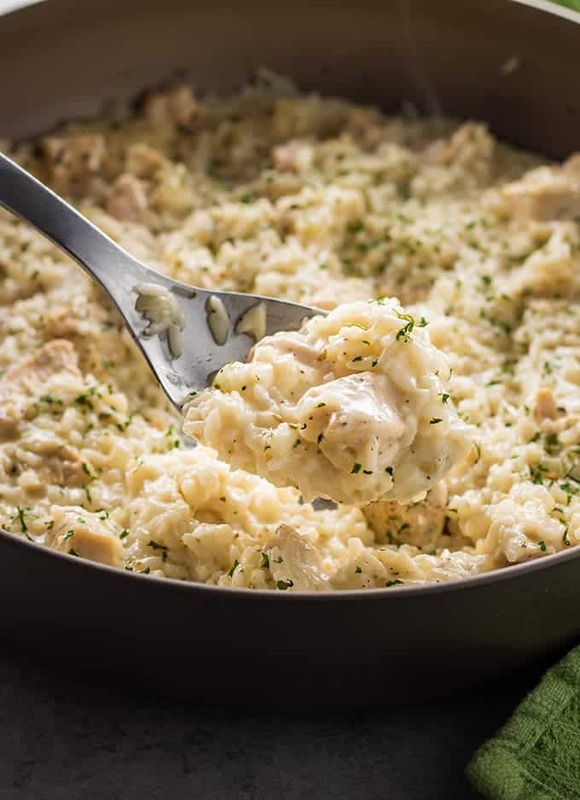 Creamy Parmesan One Pot Chicken and Rice is a creamy chicken and rice recipe made easy! The best chicken and rice full of juicy chicken and cheese! Chicken and rice is something that is very nostalgic for me. I always looked forward to a big cheesy casserole pan full of gooey chicken and rice goodness. It was asking a lot as a kid because my mom can’t stand rice! What a sweetie she is for still cooking it up for me anyway. 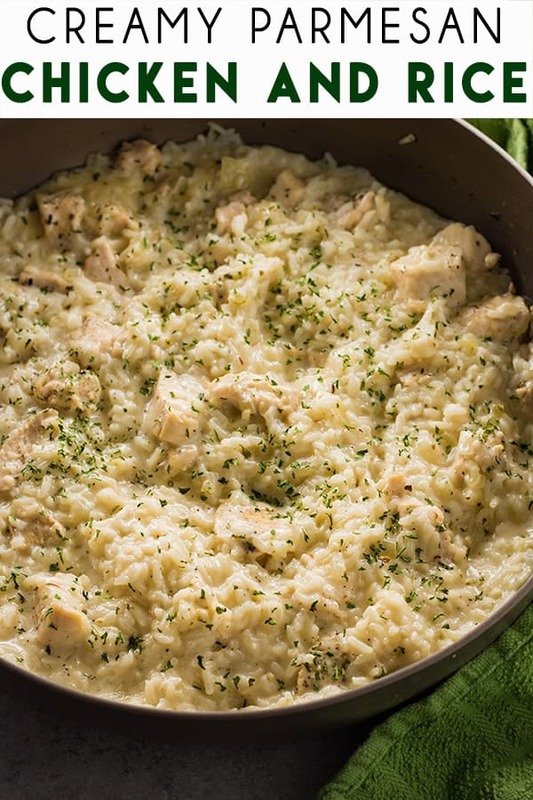 UPDATE: Since everyone LOVED this recipe so much, I made another version, be sure to try my Bacon Ranch Chicken and Rice too and if you are looking for an oven-baked version, we absolutely love this Chicken and Rice! Basically, my goal here was to simplify one of my fave childhood dinners into a really quick one pot dinner. If you are a regular follower you also know I don’t have a problem using canned soups. But, I like using all fresh ingredients whenever possible. It’s just as budget-friendly and easy, there’s really no reason not to! Mission accomplished with this dish. 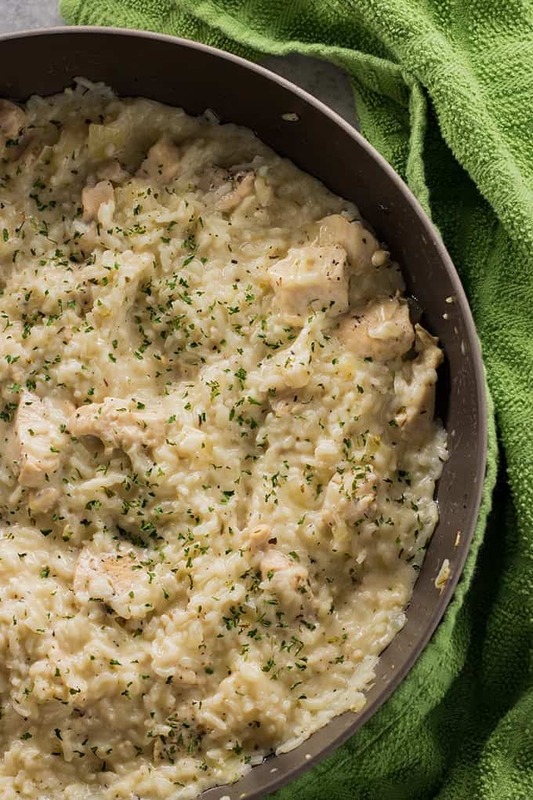 Simple ingredients like cream, parmesan, chicken broth, spices, and usual suspects like onion and garlic come together to create a truly heavenly chicken and rice. You will want to use a large (12 inch) skillet that has a lid for this recipe. If you don’t have a skillet like that you can find one that I love down below the printable recipe card (affiliate link) or you can also use a good sized pot or dutch oven with a lid. Melting your butter is your first step. After that, go ahead and add the onion and let them cook for 2-3 minutes before adding your garlic. Garlic only takes 30 seconds to 1 minute to cook, and you don’t want to add it too soon or it will burn and taste bitter. Use long grain rice for this recipe, not minute/instant rice. If you use quick cooking rice, it will cook too quickly and become mushy. Any long grain rice will work! Most of the cooking time for this one-pot chicken and rice is completely hands off. You will have about 15-20 minutes for the rice and chicken to simmer. I love to take that time to chop up a quick green salad to have on the side! 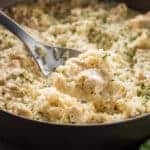 Creamy Parmesan One Pot Chicken and Rice - This deliciously creamy chicken and rice is one of the easiest one pot meals you will ever make! 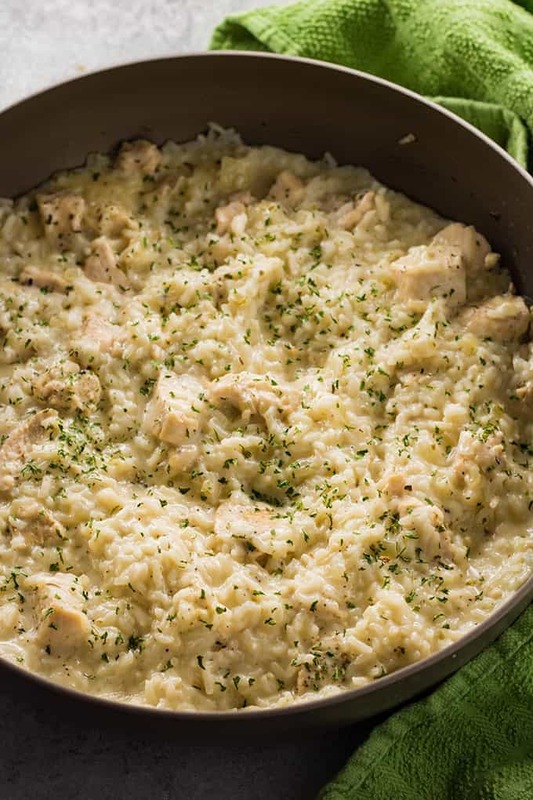 Juicy chicken and rice are cooked together in a buttery broth then mixed up with cream and parmesan cheese for a luscious 30 minute one pan dinner! Heat the butter in a large skillet over medium high heat. Add the onion and cook for 2-3 minutes, until beginning to soften. Add the diced chicken to the pan along with the Italian seasoning, pepper, and salt. Cook and stir for 5 minutes until chicken is golden on all sides. Add the garlic and cook for one more minute, stirring constantly. Add the chicken broth and rice to the pan and stir. Cover with a lid and simmer for 17-20 minutes, until rice is completely tender. Stir in the heavy cream and parmesan. Serve immediately topped with parsley if desired.